Many home and business owners have learned the hard way that nuisance birds can really get on your nerves. The Critter Team is a professional wildlife management company that specializes in bird removal, bird control, bird exclusion and bird proofing solutions for residential and commercial customers in Humble Texas and the greater Houston area. If you have birds in attic, bird in chimney or birds in vents, you know how aggravating pest birds can be. Nuisance birds are bad for business when they roost on signs, overhangs and building ledges. A flock of wild birds can make a mess, damage stone surfaces and even spread disease. The Critter Team is a professional wildlife management company specializing in the removal and control of all wild animal species, including birds, snakes, skunks, rats, armadillos, raccoons, bats, squirrels and more. Our Critter Team wildlife removal experts can install bird management products, recommend habitat modifications and complete building alterations to eliminate nuisance bird problems. Call The Critter team today at 281-667-0171 to speak with a bird management expert. If you notice scratching or fluttering sounds coming from your kitchen, laundry room, bathroom or HVAC system, a nuisance bird may have built a nest in a pipe, vent or duct. It’s important that you have the birds and nest removed as soon as possible. Once the eggs hatch, the baby birds will begin to eat, chirp and, well, poop. Things can get ugly, not to mention smelly, in no time at all. It should also be noted that bird feces is a common source of Bird Flu and various other diseases. Nuisance birds also carry mites, fleas, fungus and bacteria. Wild birds definitely make poor tenants. Call The Critter Team for expert bird exclusion and bird control services in Humble Texas.A Critter Team wild animal removal specialist can seal ventilation pipes, install bird spikes and install screen to keep nuisance birds outside where they belong. Wild birds like to roost on the corners of buildings, ledges and other easy to access architectural features. Call the Critter team today to have those dirty birds removed from your home, business or industrial facility. Nuisance birds are difficult to remove and control. It’s definitely not a job for an amateur. The Critter Team has the training and experience to alter the environment so that wild birds are no longer interested in what you have to offer. Common pest bird species like the grackle will simply search for a more acceptable roosting site. Grackles travel in large flocks and can really create a mess if they take a liking to your home, business or landscaped area. They are fairly large blackbirds with flat heads and long legs. 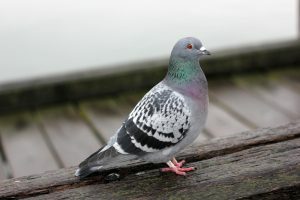 Some other common nuisance birds in Humble TX are the sparrow, starling, pigeon, Canada goose, chimney swift, woodpecker, seagull and a number of blackbird species. There’s no one better at eliminating pest bird species and other nuisance wildlife than The Critter Team. Nuisance birds are no match for a professional bird removal expert. The Critter Team specializes in bird trapping, birds in attic, birds in chimney, bird exclusion and bird proofing in Humble Texas and the greater Houston area. Give The Critter Team a call at 281-667-0171 to schedule a bird removal and bird exclusion appointment. The Critter Team is a veteran owned business that offers humane wild animal removal services, affordable prices and unrivaled customer service.